Hover over circle to see color name. Add a touch of color with our radiant shades. Just swirl your brush with color and apply. 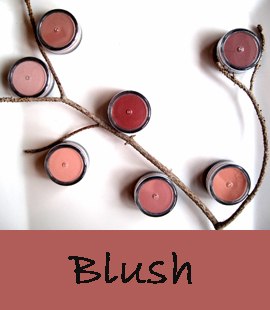 Try layering two blush colors for a new shade or dip your chapstick in minerals for beautiful lip color. Makes great eye shadow too! 20 Gram Jar - $13.95 ea. Application directions: Tap a small amount of powder into your cap and swirl your blush brush into it. Tap your brush on lid’s edge to set the powder into the brush. Sweep onto check bones for a soft touch of color. Remember our minerals are concentrated, a little goes a long way. 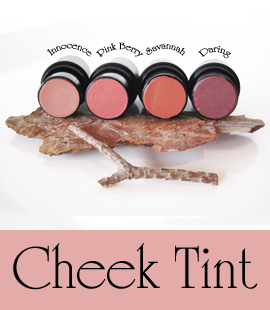 We have created a creamy, moisturizing, all natural Cheek Tint using organic oils, natural essences and mineral pigments. Can be used for cheeks, lips and even eyes! Experience soft buildable color! .18 oz - $15.95 ea. 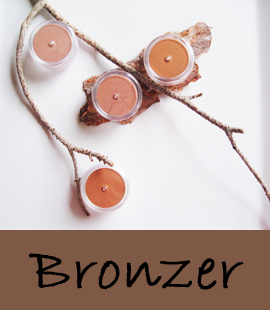 Bronzer brings a beautiful natural glow, giving you a sun kissed look. Use it also as blush or eye shadow. 10 Gram Jar - $9.95 ea. Application directions: Tap a very small amount of powder into your cap and swirl your brush into it. Tap your brush on lids edge to set the powder into the brush. Apply where the sun would naturally highlight your face, like your forehead, cheeks, nose and chin.